First of all, I am not a fan of this cover. Looking at it, I would have thought this book was an historical romance, and I would probably not have picked it up (never say never). It is historical and it is a love story, but it is also more than that. The story follows Enza and Ciro over the course of their lives, from Italy to America, and back to Italy again. For much of this book, however, they are not together; they are leading their own lives, creating their own stories. Enza grows up in a big family with loving parents. They are poor but have what they need, until the day they are told they have to leave the house they are renting. Their dream is to own their own house someday, so Enza and her father decide to go to America and work hard to send money home for a house, then move back to spend the rest of their lives living happily with their family in Italy. Unfortunately, Enza almost dies of seasickness on her way over, and is told she should never try to cross the ocean again. Enza could withstand anything, knowing that she was making her mother’s life easier. I think my favourite parts of the book are of Enza and Ciro’s Italian immigrant experience in America. Enza had to work hard; she had to learn English, work in a clothing factory, prove herself as an accomplished seamstress, all while working herself to the bone for her room and board. After many years, she and her friend did well enough to end up at the Metropolitan Opera House sewing costumes for the performances. 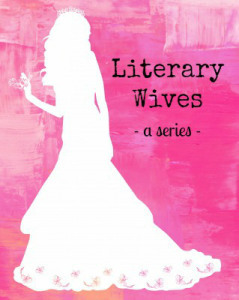 Enza got caught up in the glamour and excitement (and may have even worn a dress like the one on the cover of the book), and fell for the lifestyle and a man to go with it. Ciro and his brother were left at a convent by their mother when they were young. Although they were well cared for and did well, they carried around a feeling of abandonment. Despite this, they grew up there happy and strong, until the day Ciro caught the priest carrying on in unpriestly ways. The priest had the brothers separated. Eduardo was happy to study to become a priest, but Ciro was being sent to a work house for boys. To save him from this, the nuns arranged to have him go to America to be an apprentice to a shoemaker. Ciro became very successful at his new trade and did well. But, when the war started he wanted to sign up to do his part. He had hoped to cross the ocean again someday, but had not imagined it would be to fight in a war. God made girls, and that made Him a genius. It occurred to Ciro that men pretended to run the family, but in truth, the women were in charge. Women move through the world never knowing their power. Ciro and Enza first met when they were 15 at the funeral of Enza’s sister. Ciro had come up the mountain to dig the grave. They planned to meet again, but it was the next day that things went badly for Ciro at the convent, and he was soon gone to America without a word to Enza about it. Not long after, Enza also sailed to America for her own reasons. Theirs is a story of missed opportunities. Several times over the years they met, but there was always something that prevented their relationship from going any further. It wasn’t until Ciro was fighting in the war that he realized Enza was the only one for him, and he became determined to finally tell her so. As soon as he got back from the war. Well, from the title of the book, I guess it isn’t a big surprise that he succeeds in the end, but to give you an idea of how long their story is, Enza is only ‘the shoemaker’s wife’ for 100 pages out of the 475 pages of this book. 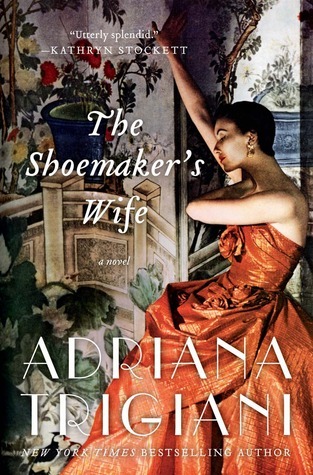 Overall, I enjoyed The Shoemaker’s Wife, partly because it’s unlike most of the books I read, so it was a fun change for me. My biggest gripe about it would be that the writing is at times a bit flowery and overdone for my taste. As a movie, I picture sweeping views of Italy with dramatic music in the background. If you are looking for a love story with a lot more to it than just love (coming of age, immigration, WWI, New York City in the early 1900s, overcoming hardships), than you might want to try out this book. Just ignore the cover. What I like about Enza is how strong and independent she is. As a child, she is mature and capable. As a young woman, she gives several years of her life to go to America where she felt alone and alienated while she worked hard and sent money home to her family. Because of her ambition and determination, things worked out well for her in the end, but at the expense of never going home and seeing her family again. She makes the most of the life she is given. She does not dwell on the negative, and avoids indulging in self pity when times are tough. She is also a woman who knows her mind and has high expectations of herself. She is kind and generous, but when it comes to what she wants and needs in life, she works toward her own happiness. When she married Ciro, she did not change her outlook and values. She worked to make their marriage as equal as possible. She told him what she thought and what she was feeling, and when he did things she didn’t agree with or like. I’m not an expert on women’s lives in the 1920s and 30s, but I’m going to hazard a guess that not all wives were this progressive. She even set up her own sewing business next to his shoemaking business, as well as becoming involved in the selling of ladies shoes (which her husband did not make). I think Enza’s idea of being a wife was progressive for her time, but I don’t think she thought about it as being so. She didn’t seem to be trying to make a point; it was just her way, the example set by her parents, and it made sense to her. I think, too, that she loved being a wife. For her, it meant being part of a family, which was important to her and what she had always dreamed of; working together to get things done, having others around to talk with and share a life with. Because she was not able to go home to Italy, I think her family meant that much more to her, which is also why the events to come in the story are so tragic. But, even then, she stays strong and does what is right, allowing her the satisfaction of a life well lived, as well as a good example passed on. But, what about Ciro? What did he think of Enza’s progressive ideas about being a wife? He made it easy for her and embraced them. He liked her strength and ambition, partly because it allowed him to have someone to lean on when he needed to. Family was just as important to Ciro as it was to her. He wanted the family he didn’t have when he was young. This, as well as Ciro’s good nature, paved the way for a successful marriage. It occurs to me, too, that being brought up by nuns may have had a positive influence on Ciro’s view of women. … Ciro realized he’d chosen Enza because she was strong alone; she did not need him, she wanted him. I often wondered if these two people were just too good to be true, but, in the end, decided to enjoy it for what it is – a fictional love story. Well, Naomi, I crapped out on this one. I’m glad you liked it better than I did. Ha! You’re right! It does look like she’s putting on deodorant. Okay, I would like to know if there is anyone at all who likes this cover?? If you’ve read our reviews of this book, you probably know everything about the book now, anyway. I am glad I read it, but it wouldn’t be high on my list of recommendations. Or maybe she is shaving her underarms. “A fictional love story.” So true! It was idealized and Enza’s attitude and their relationship seemed to be an anachronism. I too was annoyed by the cover. It did NOT match the story at all. But I appreciated learning about the immigrant experience, as you did. While theirs seemed to be extraordinarily easy, the book did give us a glimpse into how difficult it would be to start a new life in a new land. I think the book did give many glimpses of how hard it could be. Even with Enza in Hoboken. That didn’t sound like much fun. And, I kept thinking about her poor father working out there so far away from everyone for 6 years! I can’t even imagine doing such a thing. I also could imagine how awful it would be to find out you could never go home again, as planned. Enza did well with her sentence of living out her life in America (once again, maybe a little too well). I feel like there should have been more despair, but this is another example of the feeling that she was ‘too good to be true’. I completely agree with you both about the cover! I was kind of afraid it was a romance novel. NOT at all accurate. Maybe there were some people who read the book and were disappointed that it wasn’t a romance! I just read this and I think my feelings about it were similar to yours, although I might have liked it less than you did. I expected to be bothered by the missed opportunities, but I wasn’t. I shared your enjoyment of the immigrant experience part of the story, especially Enza’s story. I also found the writing too flowery, which particularly bothered me since this had been recommended to me as a book with beautiful writing. Personally, I felt like there was too much insta-love in Enza and Ciro’s relationship and given that the whole book was about how they ended up together, I felt disappointingly ambivalent about them being meant to be together. Definitely not my favorite read. The love story was definitely not my favourite part of the book. In fact, once they finally got married, I was impatient for the book to be finished, but there were still about 150 pages to go! I went into the book with low expectations, because of the cover. I can imagine I would have liked it less if I was going into it with a recommendation based on the good writing! Yay, I wondered what happened to this group since I hadn’t seen any posts lately (or maybe I’m just out of touch?). I think I would also enjoy the immigrant experience of the characters is this book. I’m always fascinated by how immigrants have adapted to different cultures in order to survive and make a new home for themselves. The Literary Wives post reviews on the first Monday every two months. So, thenext one will be the first Monday in February. This is a good book if you just want to settle in for a long story. It has a lot going for it.